The cool temperatures and ample rainfall boosted the coneflower blooms to the best I've seen in years. After losing many coneflowers, including the variety featured to aster yellows disease in 2012, I'm happy to see healthy plants. One of the short varieties, echinacea 'PowWow Wild Berry' is blooming beautifully beside salvia farinacea 'Victoria Blue' in the cottage garden. I love this combination when the blooms synchronize and peak in unison. 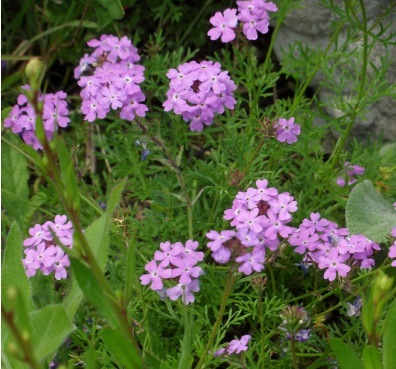 The frilly, ground-covering lavender blooms are verbena 'Imagination'. 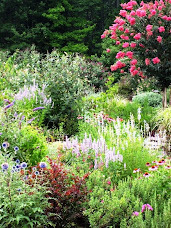 These three plants bloom over a longtime, front and center, in the cottage garden. 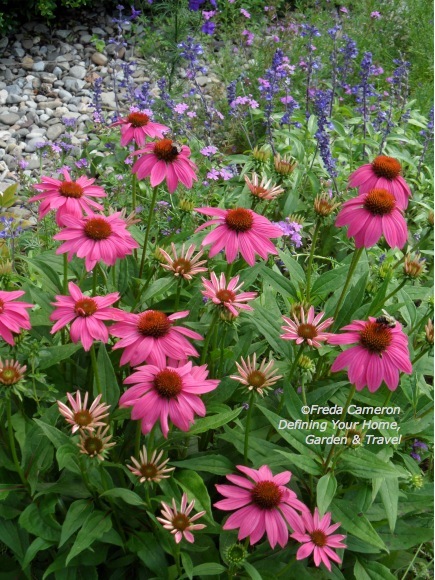 The echinacea reblooms through the summer (supposedly without deadheading, but I deadhead to speed up the repeat). It can be grown from seeds, though I purchased my plants. 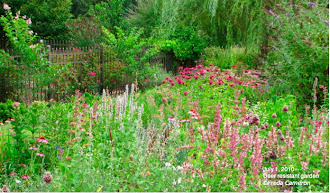 The salvia is another repeat bloomer, with the best show in early summer and again in the fall. Again, I purchased my plants, but you can grow this one from seeds, too. The combination fits well into small spaces, but the verbena is a prolific self-sower, so watch if it spreads too far and wide. I trim it back to keep it shaped for the space and pull unwanted seedlings. The verbena blooms non-stop until frost. 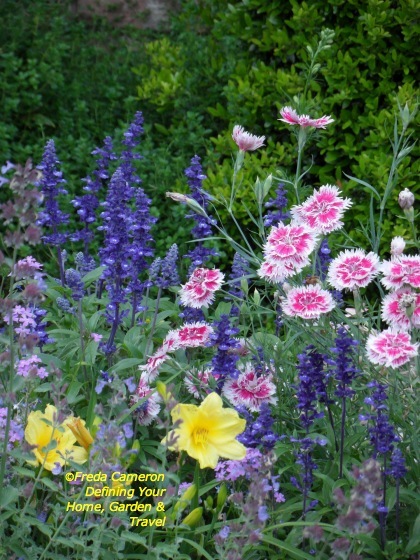 Although these three plants are great together, they seem to enhance any location in the garden. 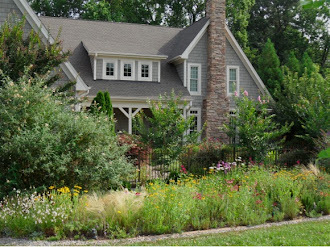 I use the verbena as an edger or filler in multiple locations. 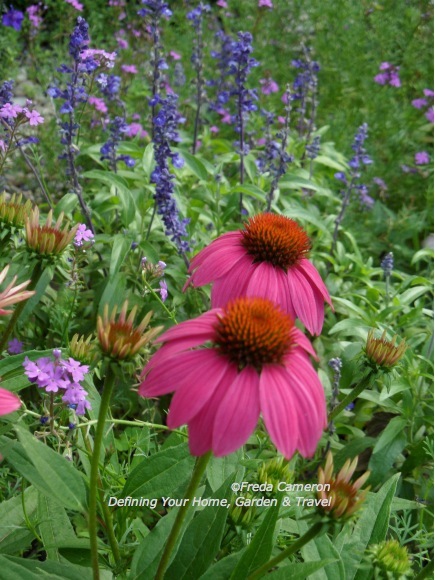 The salvia is a go-to plant to use with dianthus, zinnias, black-eyed susan and daisies. This trio is growing behind the protection of the cottage garden fence, but I grow all three in the deer resistant garden. Bunnies are more interested in the coneflowers than the deer, but in some areas, you may need to use repellents. Neither bunnies nor deer eat the verbena and I've had no issues with the salvia.